10 sprays delivers a minimum of 40mg (28% RDA) of optimally absorbable elemental magnesium together with essential oils. BetterYouTM Magnesium Oil Goodnight spray combines magnesium chloride with essential oils chamomile, clary sage and bergamot. The essential oils soothe your senses while magnesium calms and relaxes your body to help aid normal restful sleep. A unique combination of magnesium and essential oils formulated to aid restful sleep. BetterYouTM Zechstein Magnesium is absorbed immediately when sprayed onto skin, replenishing the body with this essential mineral which helps promote overall wellbeing and relaxation and relieve muscle tension and cramping. Spray onto the body and massage well into the skin. Apply directly to restless muscles 30 minutes before sleep. For best results, apply to clean, either wet or dry skin, ideally after bathing or showing. Concentrated solution of Zechstein Inside® Magnesium Chloride Hexahydrate (28 concentration), essential oils (grape seed, bergamot, chamomile, clary sage). 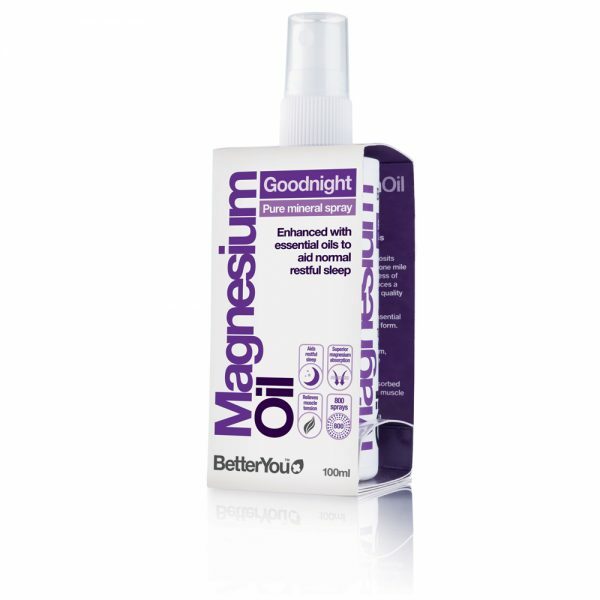 BetterYouTM Magnesium Oil Goodnight Spray is suitable from 12 years of age, for children under 12 we recommend BetterYouTM Magnesium Oil Original Spray which does not contain essential oils. For the same reasons, we also recommend BetterYouTM Magnesium Oil Original Spray for during pregnancy and nursing. 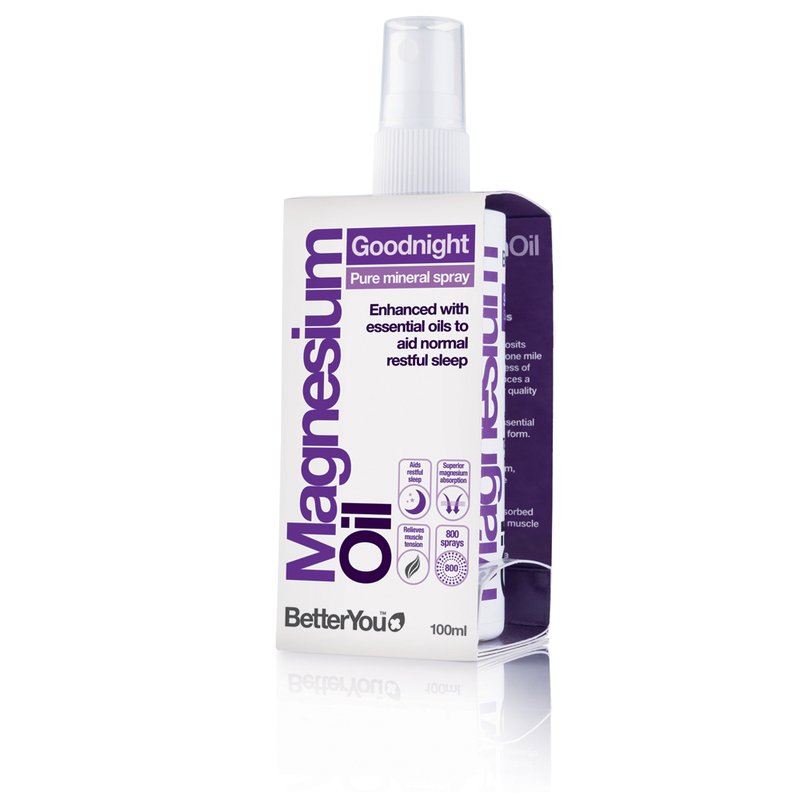 Magnesium Oil Goodnight Spray is 100% natural and is suitable for those who are on a diabetic or coeliac diet. The magnesium tingle: On initial application you may experience a slight tingling sensation. This is completely natural and indicates the high speed of absorption of BetterYouTM Magnesium Oil through the pores. This will pass with regular use but, as absorption is immediate, skin can be rinsed of towelled off after massaging in.